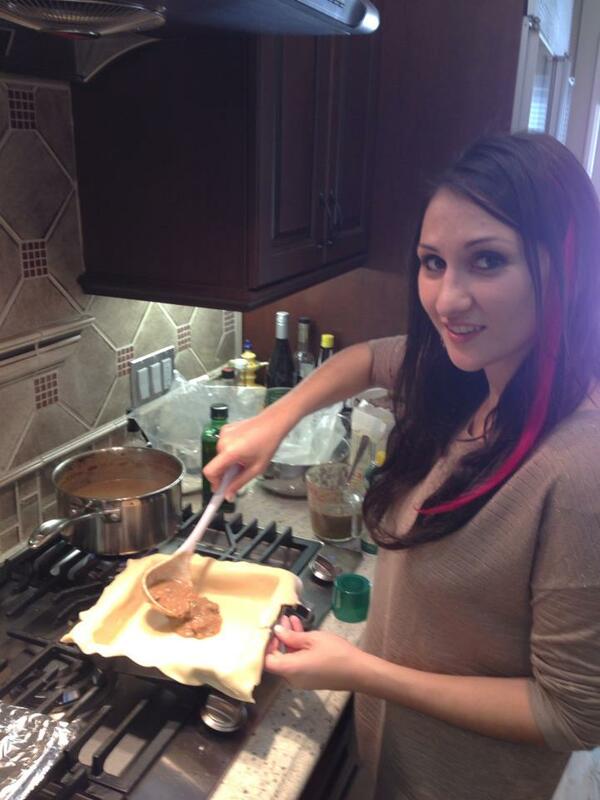 A “British” contribution to Thanksgiving Dinner! 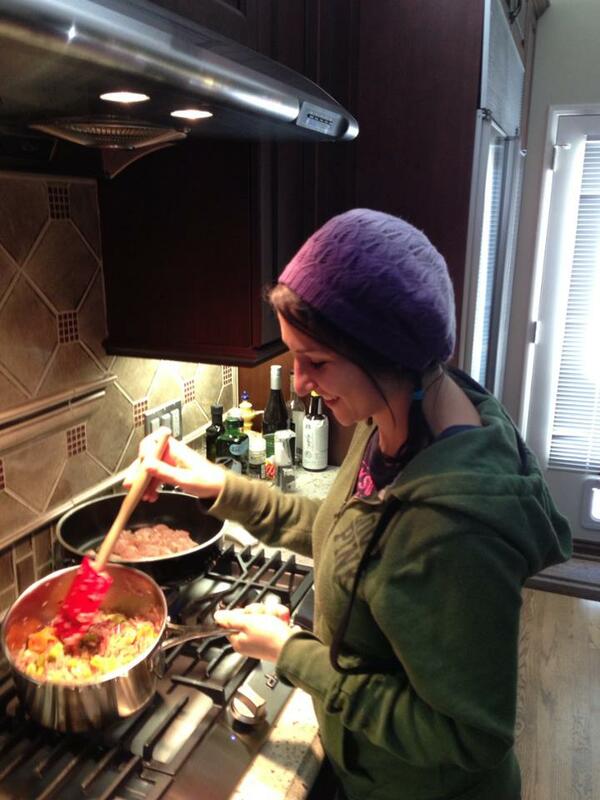 Today my post will be a Fussy One first… I am going to give you a FOOD recipe! As everyone in the United States should be aware, yesterday was Thanksgiving. This means there was probably a lot of drinking and even more eating across the country. As most of my readers know, I myself am not from the US, however I have been living here in Los Angeles for 5 years in January (is it already that long??!!) and have plenty to be thankful for. This recipe is a variation of one originally created by British Chef Jamie Oliver. I admit, it does take a little while to make this one (a good 2.5 hrs in the oven stewing the ingredients) but it is well worth the effort because the pie itself is delicious. Jamie calls for mushrooms in his recipe, but considering I can’t stand the texture of mushrooms when they’re hidden in food I have chosen not to include them. Ok, first off lay out all your ingredients and equipment to check you have everything you need. I don’t cook often so when I do I get pretty frustrated when I realize half way through I don’t have the correct pan or am missing a vital herb!! This recipe calls for a pan that can transfer from the stove top to the oven, so double check you can do that. I have had issues before when I realized the pan i’m using will not last in the oven. 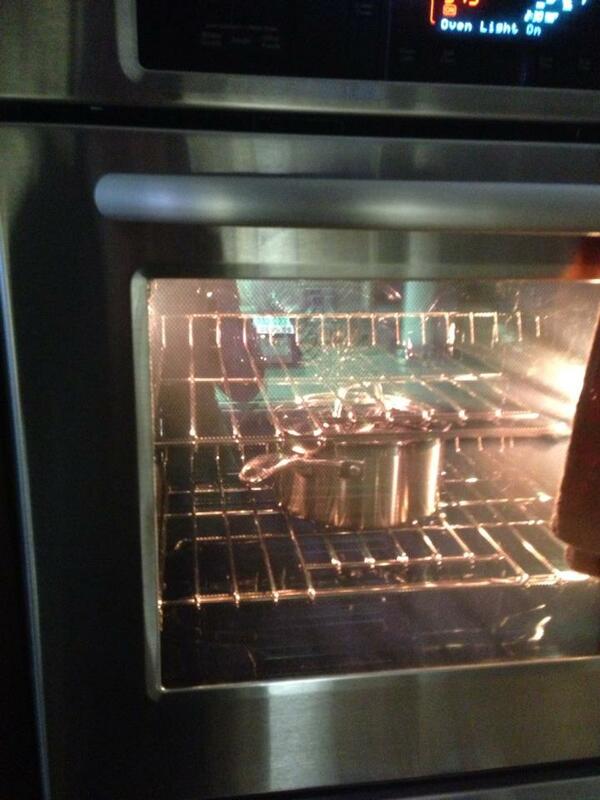 Pre-heat your oven 375ºF/190ºC/gas 5. Next start chopping the ingredients. Bare in mind that 3 medium red onions looks like a lot when chopped up and I always worry it’s too much, but it reduces completely in the stew so don’t be put off by how much there is. I personally think it’s a good idea to finely chop the celery and carrots (mainly because I hate the texture of ‘bits’ in my food) but you can chop them larger if you prefer. 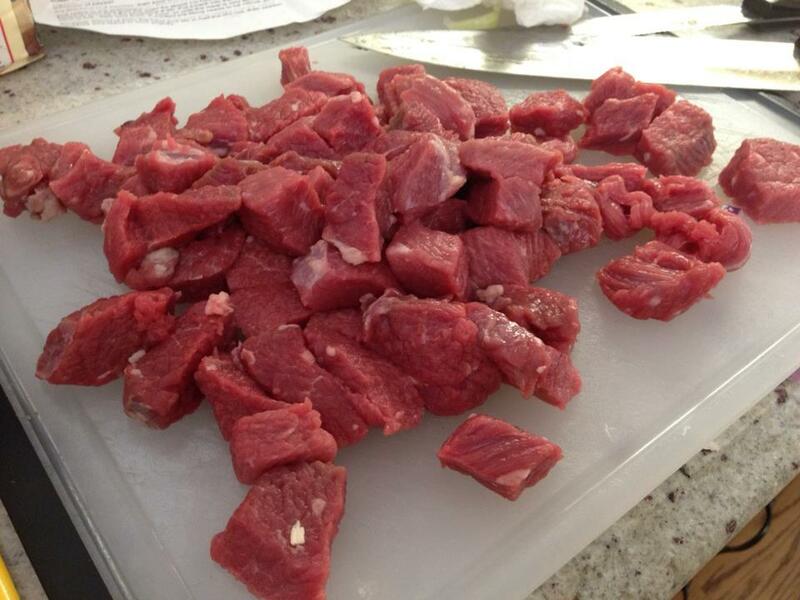 Cut the meat in to 1 inch thick cubes. Pour a ‘glug’ of olive oil in to the pan. A glug is the ‘technical term’ Jamie Oliver gives, I take it to be about a tablespoon or so…just to get the onions frying without burning. Add the onions and on a low heat start to reduce them, stir for about 10 mins. 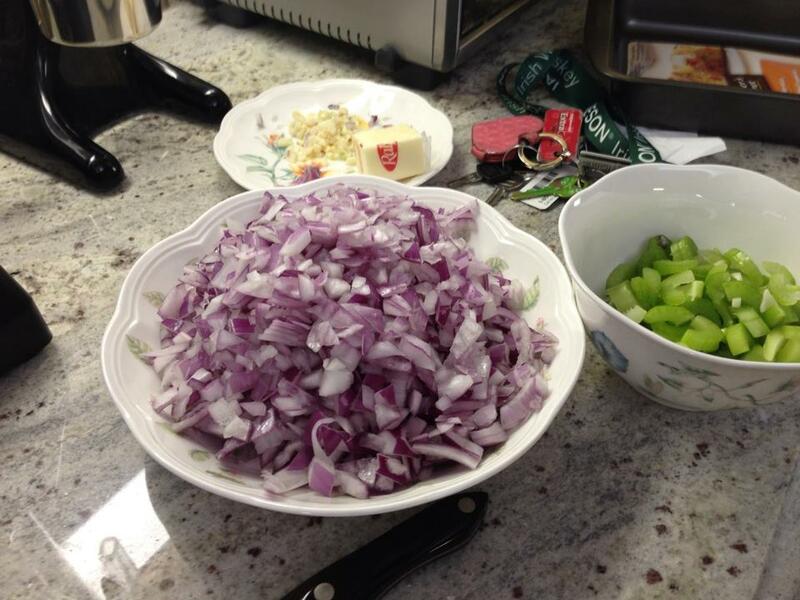 Add the garlic, butter, celery and carrots once the onions start to go clear (but don’t let them burn). Fry fast for 3 to 4 minutes then pour in the Guinness, the flour and just enough water to cover all the meat. 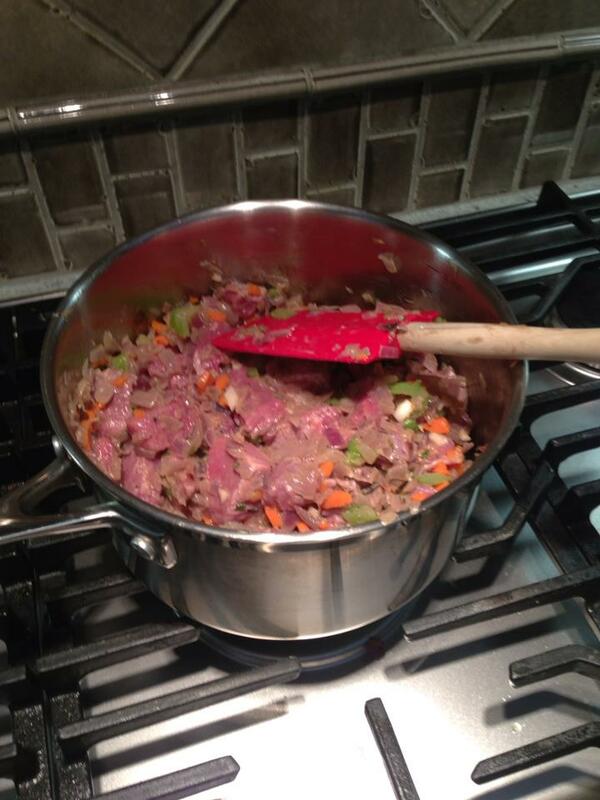 Bring to a simmer, cover the pan then place in the preheated Oven for 1 1/2hours. After an hour and a half take the stew out the oven, give it a stir and place it back in for another hour. The house will start to smell so yummy by this point, but don’t be deceived…still a long way to go!!! 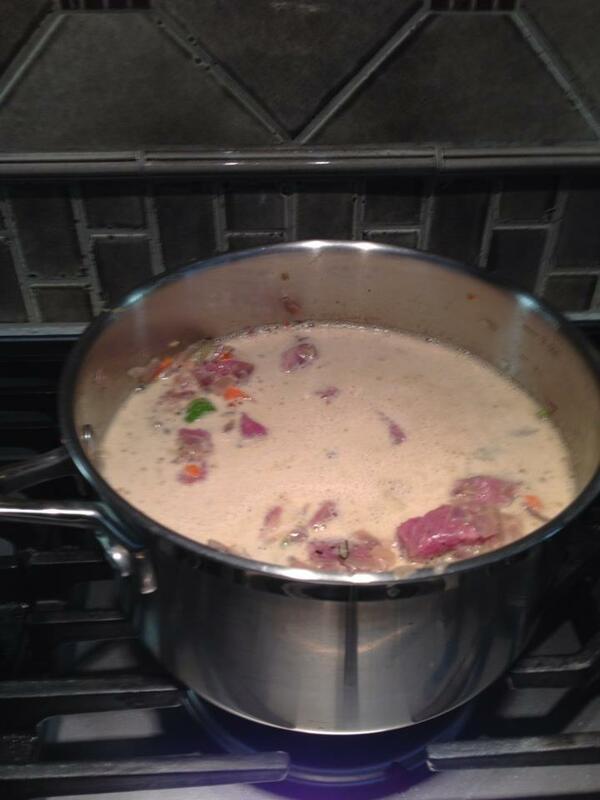 When the time is up and you take it out, the meat should be tender and the stew should be rich, dark and thick. If there still seems to be a lot of liquid (almost always is with mine) then reduce it on the stove for a little longer. A good filling needs to be robust. At this point stir in half the grated cheese too. Season to taste with salt and pepper. If you want to stop at this point you can cool the mixture and place in the fridge over night until you’re ready to fill the pie. I always make my mixture the night before, then cook it in to the pie an hour before I plan to serve it the next day. The next stage varies from person to person. The original recipe calls for “Puff Pastry” but I have established that most Americans don’t know what this is and certainly don’t sell it pre-made in Los Angeles. You can choose to make your own puff pastry or buy a pre-rolled regular pastry. Puff Pastry, for those that don’t know, is a deliciously flaky pastry used in pies in England. It is buttery and divine, but don’t be disheartened if you struggle to find a recipe because regular pastry works fine too…it’s the filling that makes this pie in my opinion! 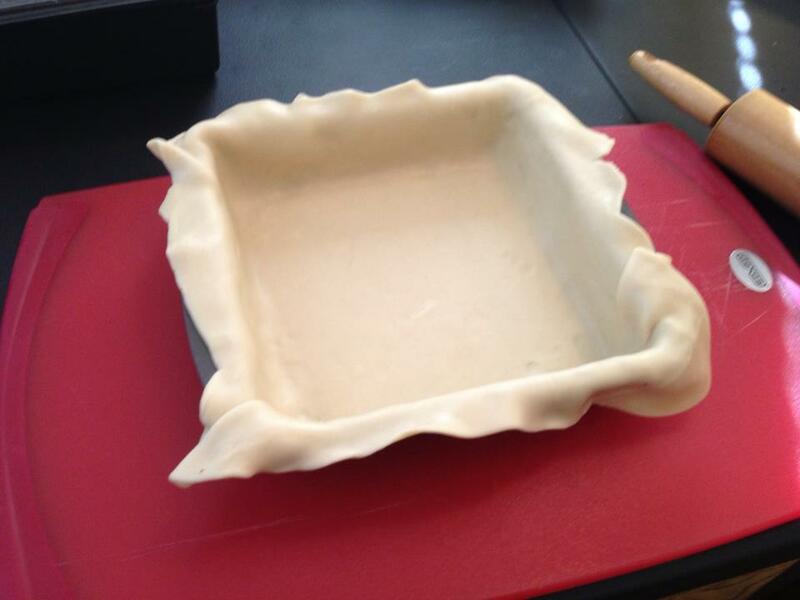 Roll out your pastry (if needs be) to make sure it will fit a deep dish pan. 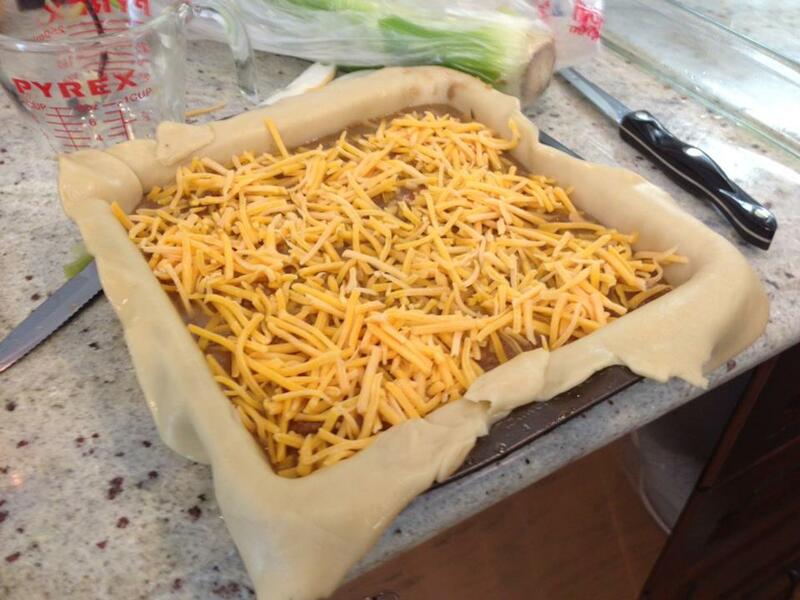 Line a deep dish pan with the first sheet of pastry and make sure the edges are dangling over the sides so you can fold them together at the end. Pour or spoon the mixture in to the lined pan and even it out. Sprinkle the rest of the grated cheddar on top. 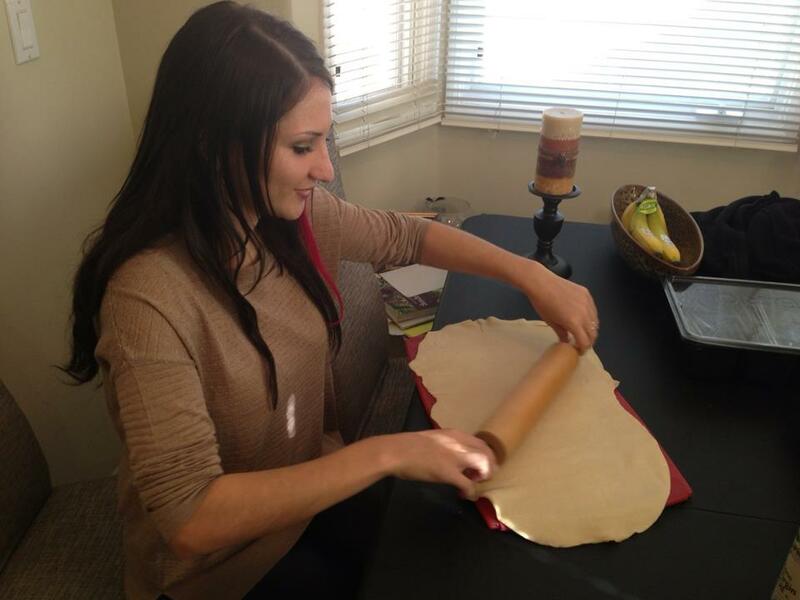 Roll the second sheet of pastry over the top. I like to twist the overlapping pastry together to make it look pretty, but you can simply crush it with a fork and cut off the excess if you like. Poke some holes in the top and brush with a little beaten egg. 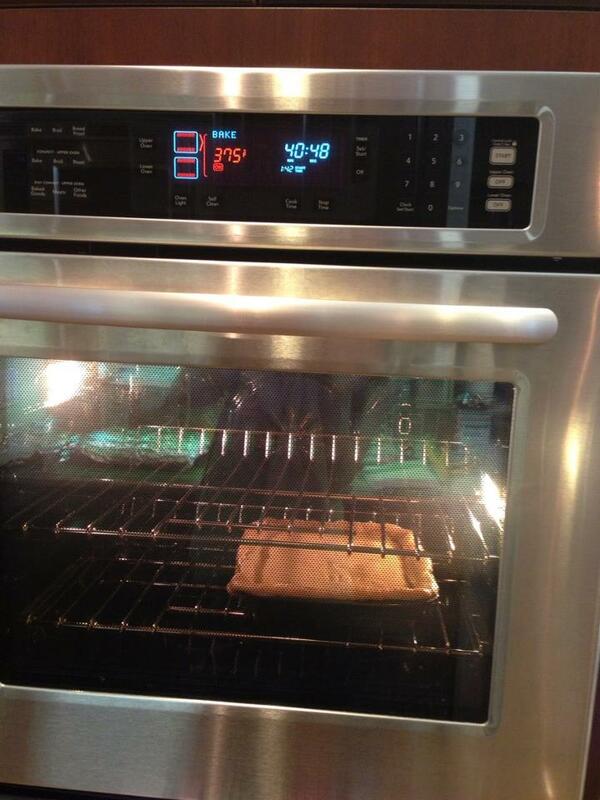 Place the whole pie in the oven on the bottom shelf for 45 minutes at 375ºF/190ºC/gas 5. When the top is golden, take it out and serve. DELICIOUS!!! Thanksgiving is a day when we get to say what we’re thankful for, and so I want to say “I am thankful for my American family.” My loving boyfriend and his wonderful parents have always made me feel so welcome in their home and I appreciate them so much…his brother and grandparents, Aunties and cousins have done the same and made me feel part of the family every year. 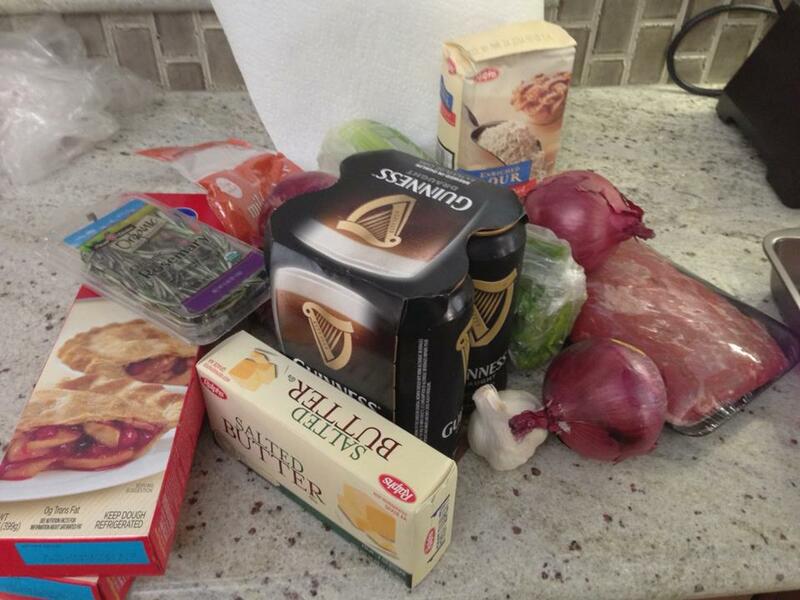 I am also thankful to my parents in England, and this British pie is a representation of them too. I may be biased – Dad’s are allowed to be – but reading this delicious and enticing recipe caused me to plead with Fussy One’s Mum that she make this pie for me, following the recipe to the letter. This is now promised for the coming weekend and I am excited! Yay! 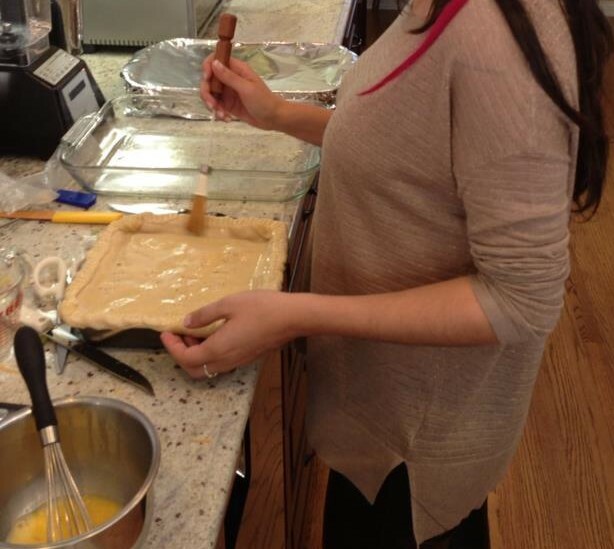 Let me know how it turns out, just so you know it is a LONG process to make the filling so a lot of work for mum!!! I loved this pie the first time round.It is mid-January and trying to snow.I shall now make it again for this weekend.But with a lot more gravy.By the way,it is great cold so would be good for a picnic.